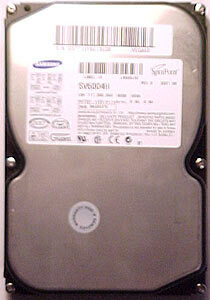 Abstract: Generally, the 7200RPM drives are preferred these days for their quick access times. While you might be mistaken for thinking that Samsung only make LCD displays, this Korean company does have a rather broad range of products. With any computing product, storage is an essential, and a 60GB hard drive can offer ample room to store programs, music and information. What makes one hard drive better than another is speed - how fast can you access the information on the drive? Generally, the 7200RPM drives are preferred these days for their quick access times and typically high areal densities. Spinning at a lower, and quieter 5400 RPM, the Samsung 60GB SV6004H offers great performance with a density of 30GB/platter. 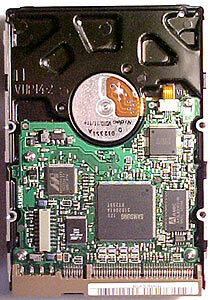 The SpinPoint SV6004H uses AMIC memory for the 2MB buffer. It appears to be 10ns SDRAM by the looks of it. Like other Samsung hard drives we've looked at previously, the SpinPoint SV6004H is very quiet in operation, maxing out at 3.2 bels thanks to Samsung's calls NoiseGuard. The PCB is fully exposed on the under side of the drive so it is important not to bash the drive around too much during installation or components, or motor wires may become damaged. Note that the Maxtor hard drive uses 3 platters and 6 heads, while the Samsung 60GB drive only uses 2 platters and 4 heads. The SpinPoint rotates at only 5400RPM but has a higher arial density than the Maxtor 5T060H6 which rotates at a speedier 7200RPM. The Maxtor drive also produces slightly more noise (3.3 bels). Each of the test hard drives was cleanly formatted and set to one partition of the maximum size. Hard drives were connected to the test motherboard via an 80 wire ATA-100 compliant cable in groups of two. No other devices (like CD ROM's for instance) were connected to the same IDE channel as that of the drives being tested. To ensure that everything was configured properly, we used Samsung's SETUDMA.EXE utility to reset the test drives to ATA-100. The utility and instructions on how to use it can be found here.